For other uses, see Cornucopia (disambiguation). Mythology offers multiple explanations of the origin of the cornucopia. One of the best-known involves the birth and nurturance of the infant Zeus, who had to be hidden from his devouring father Kronus. In a cave on Mount Ida on the island of Crete, baby Zeus was cared for and protected by a number of divine attendants, including the goat Amaltheia ("Nourishing Goddess"), who fed him with her milk. The suckling future king of the gods had unusual abilities and strength, and in playing with his nursemaid accidentally broke off one of her horns, which then had the divine power to provide unending nourishment, as the foster mother had to the god. In another myth, the cornucopia was created when Heracles (Roman Hercules) wrestled with the river god Achelous and wrenched off one of his horns; river gods were sometimes depicted as horned. This version is represented in the Achelous and Hercules mural painting by the American Regionalist artist Thomas Hart Benton. 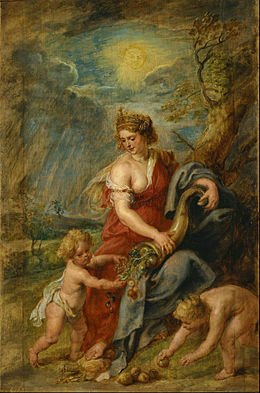 The cornucopia became the attribute of several Greek and Roman deities, particularly those associated with the harvest, prosperity, or spiritual abundance, such as personifications of Earth (Gaia or Terra); the child Plutus, god of riches and son of the grain goddess Demeter; the nymph Maia; and Fortuna, the goddess of luck, who had the power to grant prosperity. 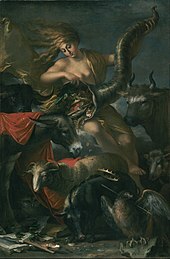 In Roman Imperial cult, abstract Roman deities who fostered peace (pax Romana) and prosperity were also depicted with a cornucopia, including Abundantia, "Abundance" personified, and Annona, goddess of the grain supply to the city of Rome. Hades, the classical ruler of the underworld in the mystery religions, was a giver of agricultural, mineral and spiritual wealth, and in art often holds a cornucopia. In modern depictions, the cornucopia is typically a hollow, horn-shaped wicker basket filled with various kinds of festive fruit and vegetables. 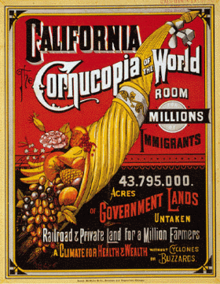 In most of North America, the cornucopia has come to be associated with Thanksgiving and the harvest. Cornucopia is also the name of the annual November Food and Wine celebration in Whistler, British Columbia, Canada. Two cornucopias are seen in the flag and state seal of Idaho. The Great Seal of North Carolina depicts Liberty standing and Plenty holding a cornucopia. The coat of arms of Colombia, Panama, Peru and Venezuela, and the Coat of Arms of the State of Victoria, Australia, also feature the cornucopia, symbolizing prosperity. In Terry Pratchett's Discworld series of fantasy novels, the witch Tiffany Aching was briefly in possession of the Cornucopia which is badge of office of Summer, when she contracted avatarism as well as ped fecundis during the events of Wintersmith. This causes problems by spurting out food and animals, including a massive flock of chickens. The motif of the cornucopia is used in the book series The Hunger Games. In the eponymous gladiatorial games described in the series, a large horn-like cache filled with weapons and equipment is placed at the starting point: this cache serves as the focal point of fighting during the games' first minutes, and is even called the "Cornucopia". In the film adaptation, the national anthem of Panem, the series' primary setting, is called "the Horn of Plenty", which is mentioned several times in the lyrics. The horn of plenty is used for body art and at Halloween, as it is a symbol of fertility, fortune and abundance. ^ David Leeming, The Oxford Companion to World Mythology (Oxford University Press, 2005), p. 13; Robert Parker, Polytheism and Society at Athens (Oxford University Press, 2005), p. 422.